These resources were developed by the Center for Shelter dogs. Here's a video which shows a jumpy mouthy (JM) dog. Please note that some dogs are only jumpy, some are only mouthy and some are both. There is a difference between a dog being mouthy and biting. Biting is a form of aggression, often accompanied by growling, teeth baring and snapping, and most often occurs when a dog is fearful of something or protecting a valued resource. Dogs jump and mouth for a variety of reasons. The first is play. Dogs play with each other by jumping and mouthing, so it comes naturally to play with people in the same way. The second is greeting behavior. JM dogs love people and exuberantly greed most new people that they meet, with jumpy and/or mouthy behavior. JM dogs often show this behavior when a person reaches out to pet them. The third is to get a person's attention. There is no better way to get a response, either positive or negative, than by jumping up. Young dogs develop social and emotional attachments to other dogs and people through play. When playing with their littermates, puppies learn to control the pressure of their bites. If one puppy bites another too hard, the puppy who was bitten often reprimands the biting puppy, and either the conflict is resolved or a fight may break out. Puppyhood is also a perfect time for people to begin teaching puppies how to play. Often by the time a puppy is 4 months old, play mouthing decreases. However, if people are not around to provide consistent training and companionship, or less commonly, if people are around, but aren't able to provide enough exercise, enrichment and training to meet a high energy dog's needs, the mouthing may not decline. Influence of stress: The stress of being in a shelter, especially related to the decreased interaction with people, decreased exercise, and lack of control of their environment, often results in increased attention seeking (jumping, mouthing, barking) behaviors. Some JM dogs initially respond to a behavior plan, but their JM behavior worsens as they stay in the shelter for long periods of time. Keep training sessions short 15-30 minutes is plenty. Break up training sessions into periods of ignoring inappropriate behavior/rewarding calm behavior, play, training and quiet time. The length of individual periods will vary depending on the dog. 1. Implement the Say Please Program every time anyone interacts with dog. 2. Ignore JM behavior and reward calm and/or friendly behavior. When the dog demonstrates JM behavior, ignore it and do not reward it: Turn away from the dog, stand perfectly still, cross your arms and do not make eye contact with the dog. Some dogs keep jumping/mouthing despite ignoring them. With these dogs, it can be useful to tether the dog so that you can approach when the dog is not jumping and safely move away when the dog is jumping. Alternatively, you could leave the room when the dog starts jumping. When the dog is NOT jumping or mouthing, reward good behavior with a click (or praise) and a treat. Quick and accurate timing of your clicks/praise, and a high rate of reinforcement for good behavior will often drastically improve your success with JM dogs. 3. Play with people - play is crucial as a method to exercise dogs and teach the dog fun and acceptable ways to interact with people. 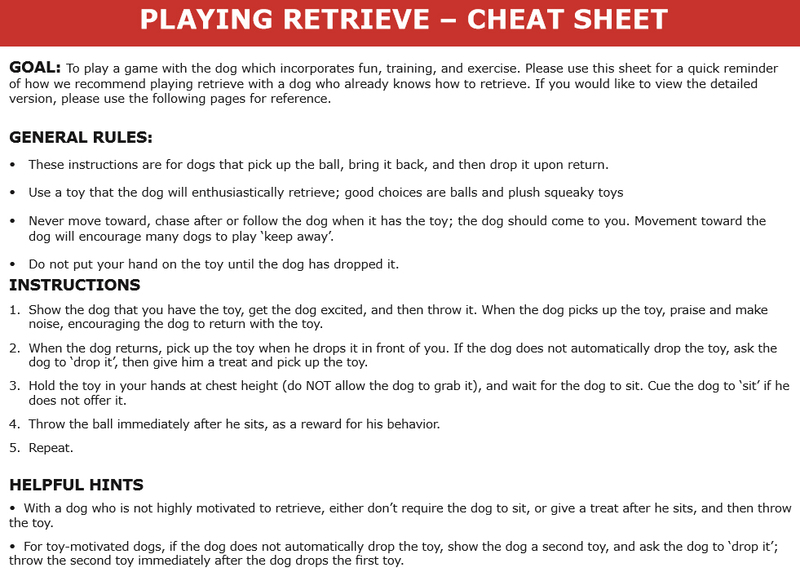 Dogs can also be taught to 'drop it' when retrieving or playing with tug toys, which is a very useful cue for JM dogs. With JM dogs, begin Retrieve Training [PDF]. 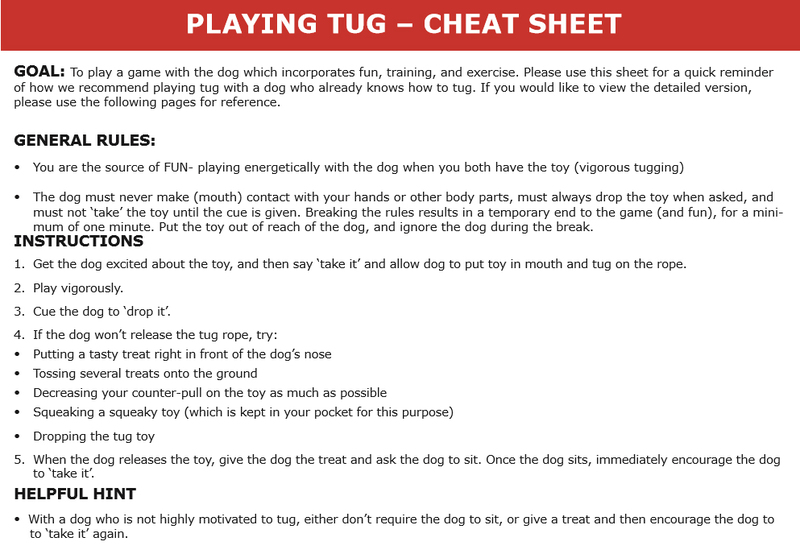 Once the dog retrieves well, move on to Tug Training [PDF]. 4. Basic training allows us to teach the dog desirable behaviors (i.e., look, sit, down) which we can reward. Keep training sessions short (1-2 minutes) to maintain the dogs' interest and motivation. 5. Keep providing high value rewards in the crate to help the dog enjoy being confined in their crate. Crate training prevents destructive behavior. 6. If the dog enjoys other dogs, play sessions with other dogs are a great way to burn off excess energy! * Important Note: Some frequently recommended methods to stop JM behavior such as "kneeing", grasping the dog's feet and squeezing, grasping the dog's muzzle or scruff often make matters worse. Many dogs misinterpret these behaviors as play and think that they are fund. As a result the JM behavior gets worse instead of better. * The use of a Gentle Leader or other head collar will help to control the JM behavior if it occurs on walks. Here's a handout on Introducing a dog to a Gentle Leader [PDF].